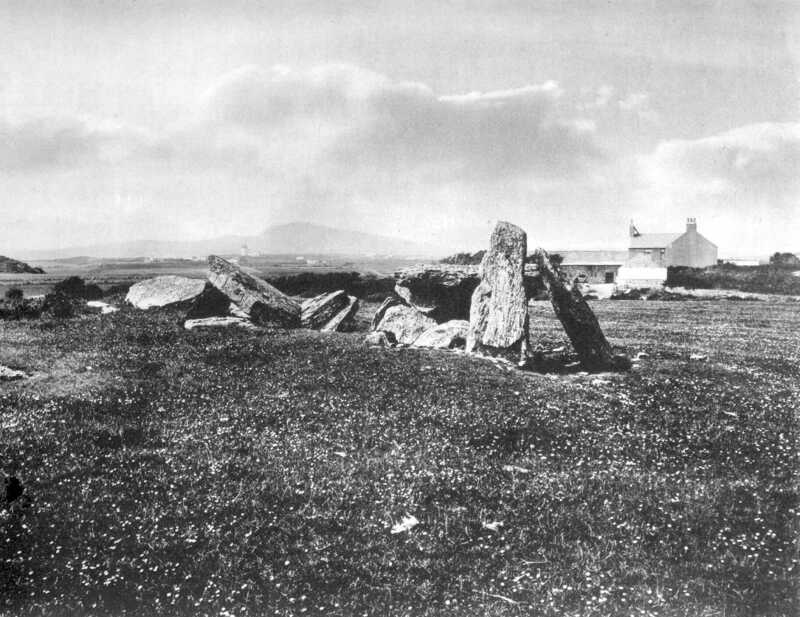 What remains of this Cromlech stands near the farmouse of Trefigneth, about one mile and a half out on the road leading from Holyhead to [Trearddur Bay]. The late Hon. W. O. Stanley expressed the opinion that it had been a covered chamber of about twenty feet in length, and three feet three inches to four feet in height, and four feet wide inside, and composed of a row of upright stones on each side covered with large flat stones. ( See Arch. Camb. Vol. XIII. p.234, 1867). The two supports that lie at the north-eastern extremity are of the following dimensions, viz: one is six feet seven inches high and four feet three inches wide at its base; the other is six feet six inches high. The capstone that lies near these is nine feet nine inches in length. Lying edgewise on the ground, and forming part of the chamber, is a slab ten feet nine inches long. At the south-western end the capstone has fallen towards the north-east and rests obliquely with its lower end upon the ground and the upper one leaning on an upright three feet three inches high. The capstone is nine feet long by five feet ten inches wide.